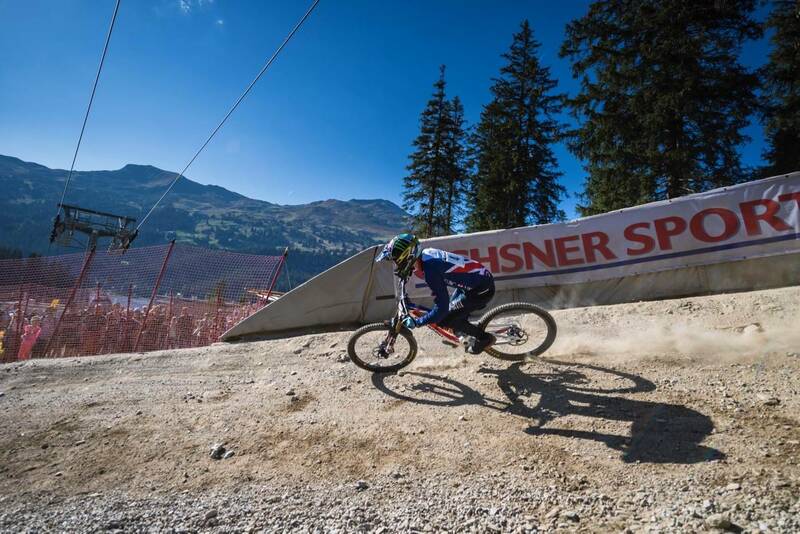 The last day of the World Championships delivered 4 champions, the fastest mountain bikers down the hill in the world. 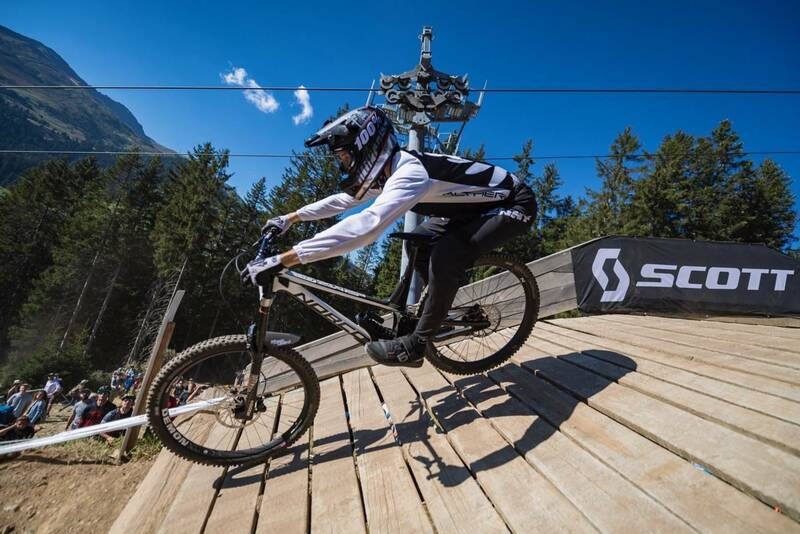 Sunday saw a different crowd swell into the lower slopes of the Lenzerheide Bike Park, as Valentina Holl (Austria) and Kade Edwards (Great Britain) won the Junior Downhill in the morning, and Rachel Atherton and Loic Bruni took the Senior titles in the afternoon sun. With the course being wet, then drying, it was always going to be a case of how it would look on race day. It doesn't take much moisture to get the forest slippery, but as the sun warmed up the morning dew dried. "To be honest I had never been so nervous, I put a lot of pressure on myself. I was waiting for a mistake, but it never happened. I'm pretty happy!" said Valentina Holl in the press conference. 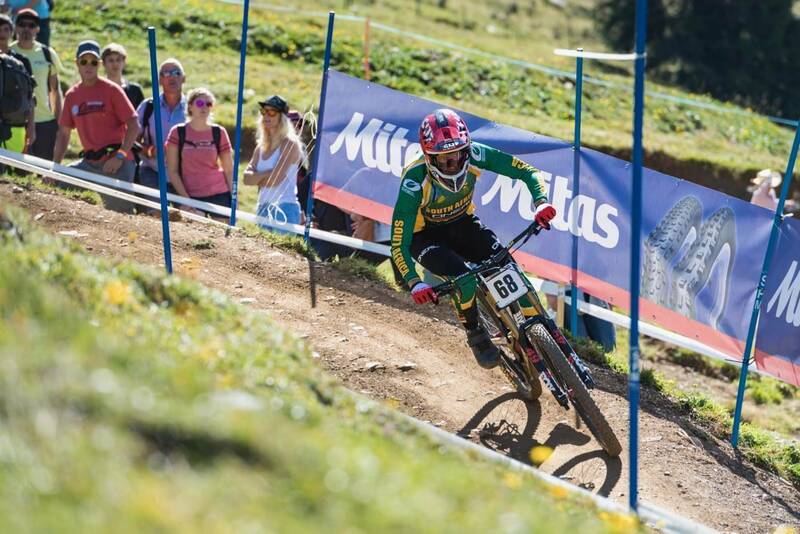 After a super clean run of World Cups, the Championship title cements a perfect season. Anna Newkirk of the US placed 2nd. As she is absed here in Europe - it almost felt like a home race, "It was insane I had so many friends and family watching, It meant a lot to me that they were here. 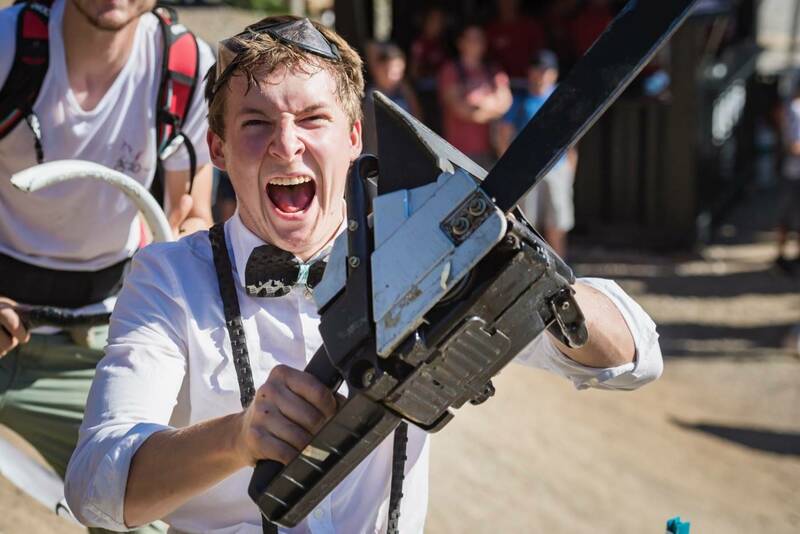 It was an amazing experience." She was 10 seconds back on the dominant Holl, and refelcted on her run, "I made a few mistakes, but all in all it was good. I made it down without any crashes or big mistakes." 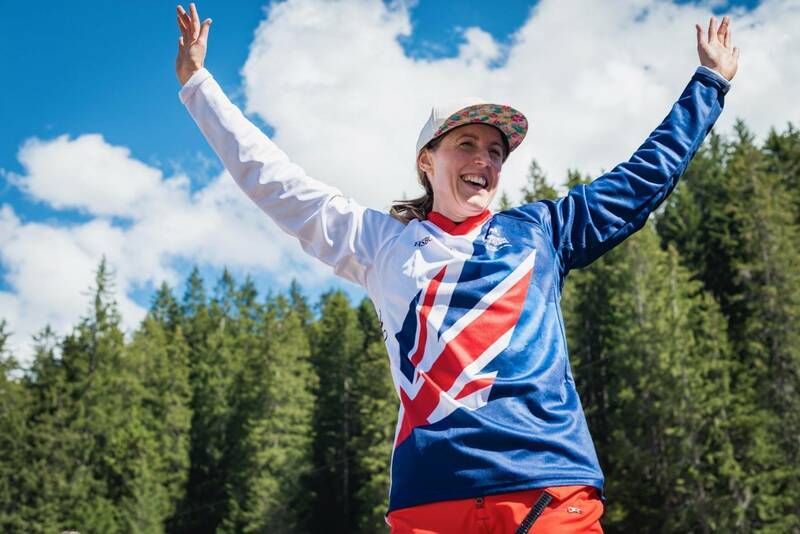 In 3rd place was Mille Johnset of Norway, buzzing with excitement with her bronze medal, "This morning was so good, I had two perfect runs in the morning and felt really conifdent going into my race run. It's kind of emotional, it's been a hard season. It's really good to be able to finish with this." 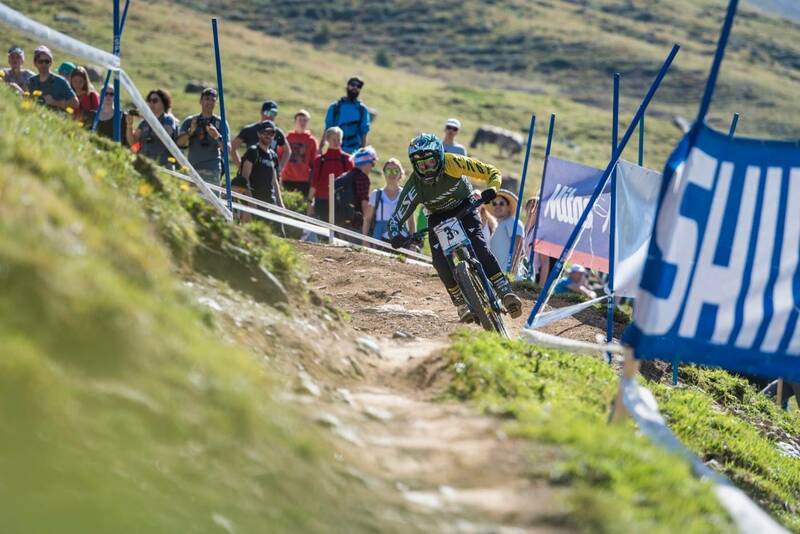 In the Junior Men, Kade Edwards backed up his stomping qualifying time with a blistering race run. "It was sweet - I was pinned the whole way!" Said Kade Edwards in the press conference. "I've been waiting for something like that all season, I just kept making mistakes but today worked out really well." The course last year wasn't really to his liking, but with some changes in 2018 - things seemed to have worked out for Edwards. "Last year I came out here and hated the track but this year I really liked it." Edwards liked it enough to be over 4 seconds faster than Australian Kye A'Hern who won Silver. "Today was good, the top started really well," said A'Hern. "I hit all my lines well, got through the rock garden really fast. In the middle I made a small mistake but I'm stoked to walk away with Silver." 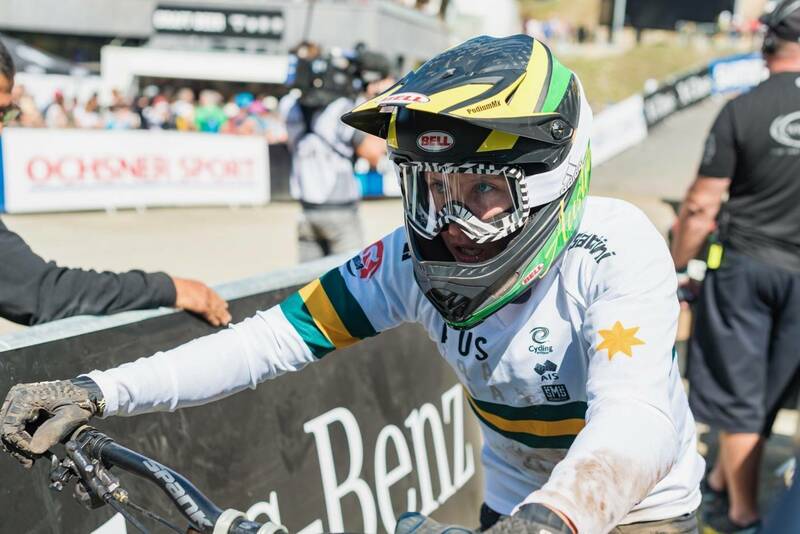 "It was a good season, it started really well getting a 3rd in Croatia, but I blew myself away winning the next two World Cups," added A'Hern. 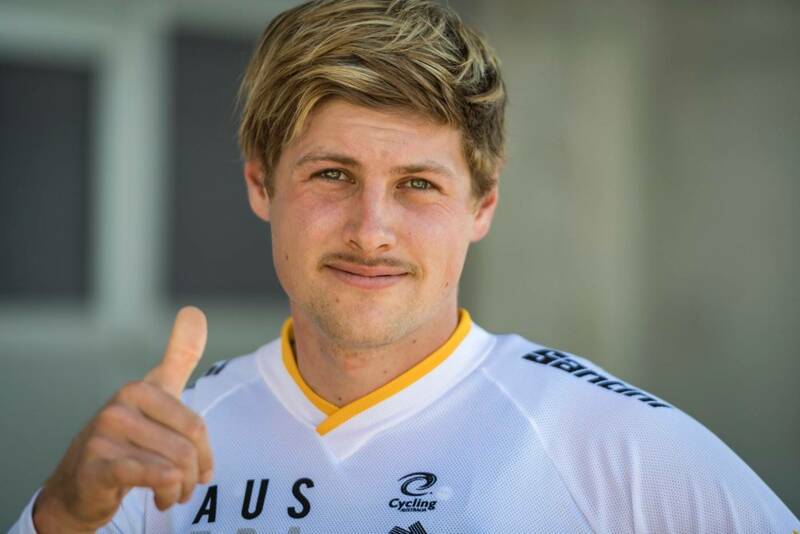 "But I'm stoked to end it on a good note." 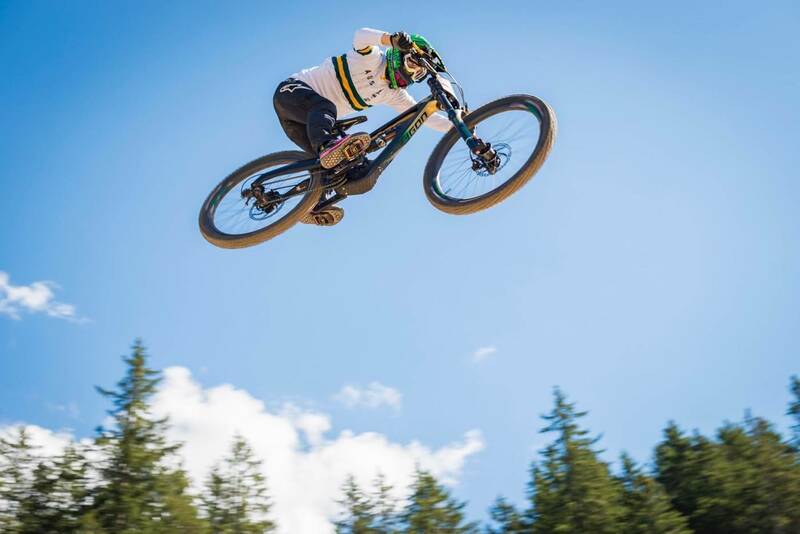 Elliot Jamieson only got his downhill bike a couple of months ago, and has been racing lots of cyclocross, cross-country and enduro recently. But that fitness and natural ability really worked for him - along with not feeling any pressure. "I sort of had a goal to go for top 10, but I felt really good in practice. I didn't feel nervous, but I prepared well and I don't really believe it. I was shaking in the hot seat, but I'm just so happy." 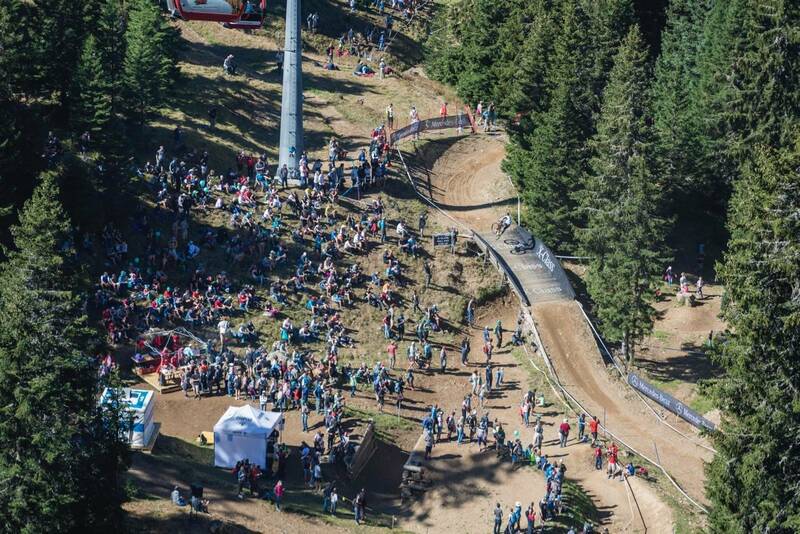 In the brief period between the Junior races and Elite, the crowd for the chairlift grew. It snaked through the whole expo, rivalled in length perhaps only by the traffic arriving in Lenzerheide. 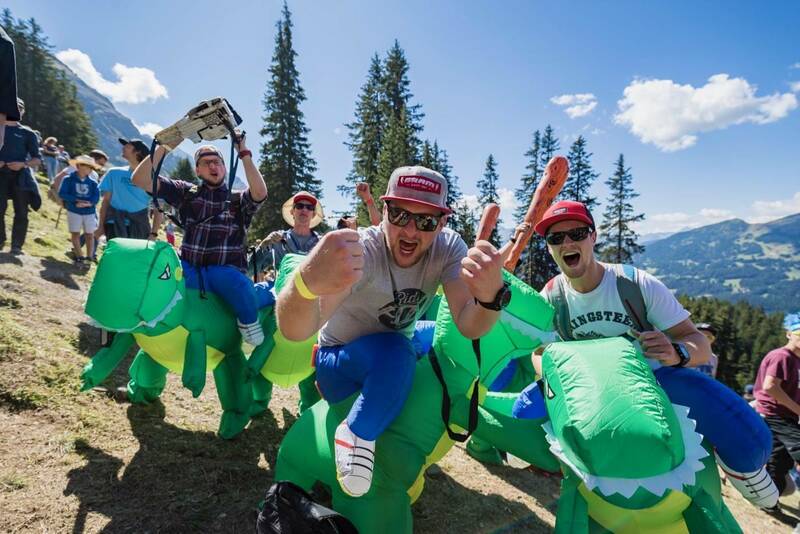 Spectators infiltrated just about every piece of forest that wasn't taped off, with the ability of the Swiss to scale steep grassy slopes in such surefooted confidence a marvel to behold. Sausages cooked, Euros baked in the sun, people smoked, drank beer, made noise and cheered. It would be a good Sunday - maybe better with less smoking. 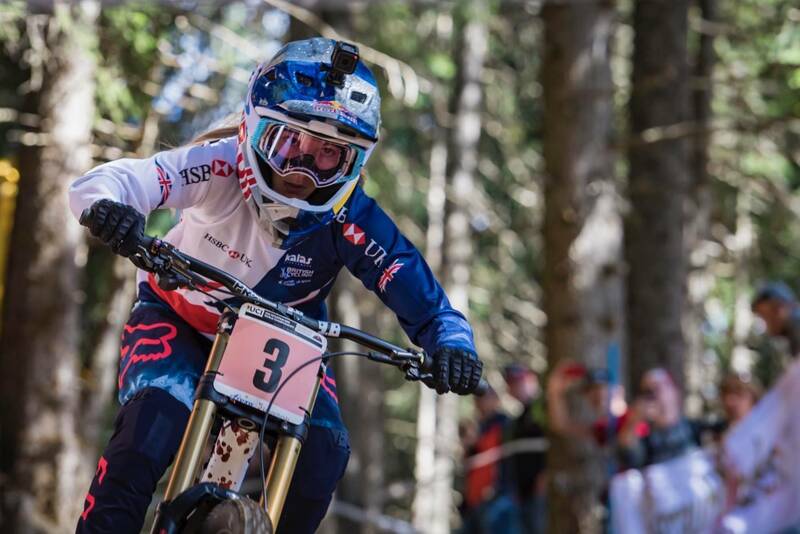 In the women's downhill, Swiss enduro rider Caroline Gehrig was in the hot seat at first, while Danni Beecroft and Tegan Molloy came into to sit in 3rd after their respective runs. 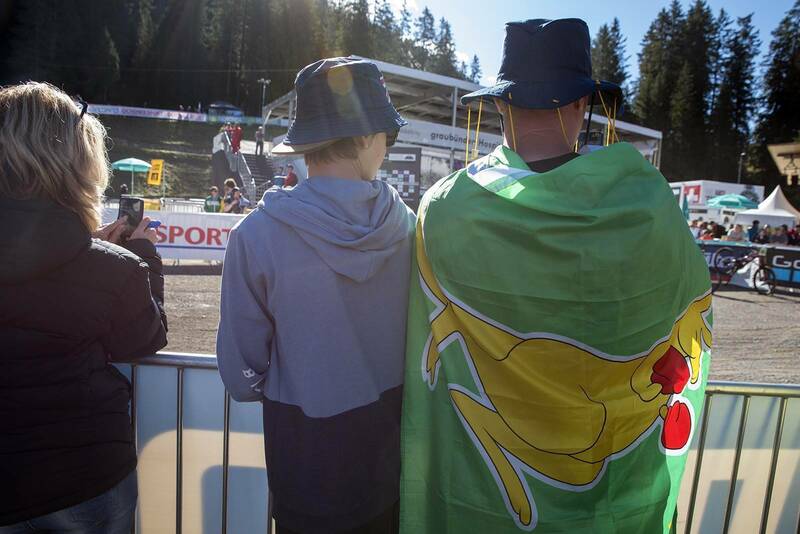 Every Swiss rider that came down had bigger cheers than other riders - but every rider rode a wave of support. Soon enough the times on the track began to tumble. 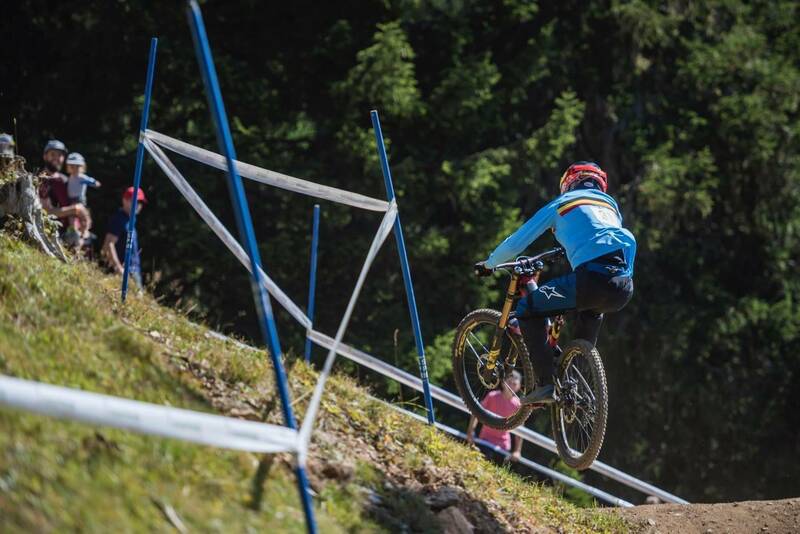 First it was Marine Cabirou who set a scorching time, but then her compatriat Myriam Nicole knocked her off the top step. 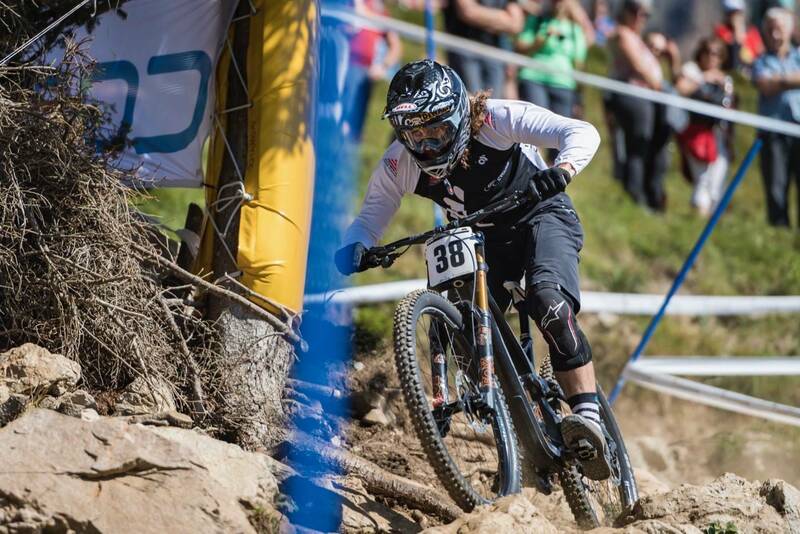 Tracey Hannah's run was next but she couldn't get ahead on the splits, and crossed the line moving into 3rd place - with just two riders to go: Tahnee Seagrave and Rachel Atherton. 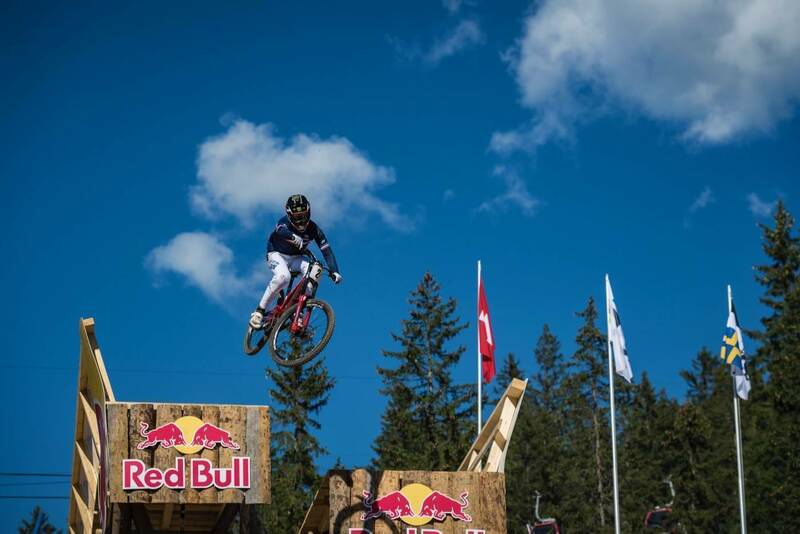 When Great Britain's Seagrave took to the course, at first she was just behind Myriam Nicole, but she shut down the gap in the final sections and moved into the hot seat. 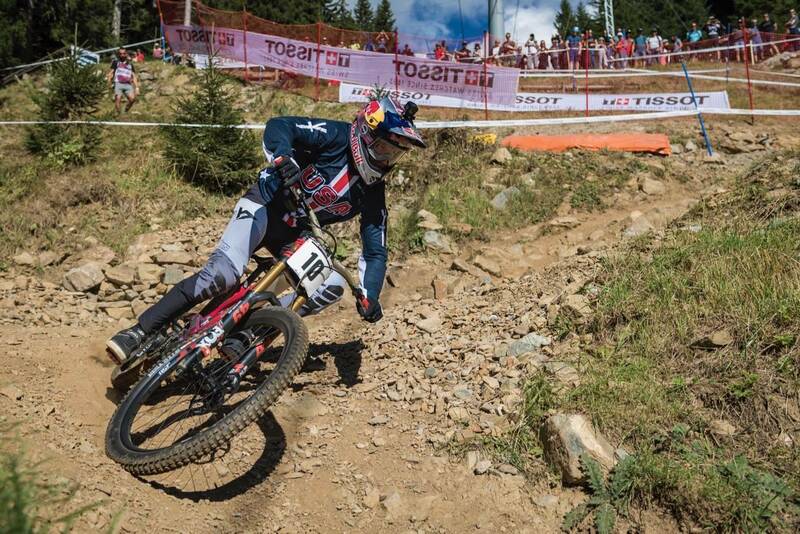 But could it last when her Team GB team mate and World Cup rival, the all-conquering Rachel Atherton, left the start gate? Atherton was up at the first split, and clawed time back every single split after that. She took aggressive lines, and dominated the track, posting a winning time nearly 10 seconds faster than Seagrave! Atherton's time was 3:15:738. Rachel said post race that she was surprised she won - given the speed of the other women. 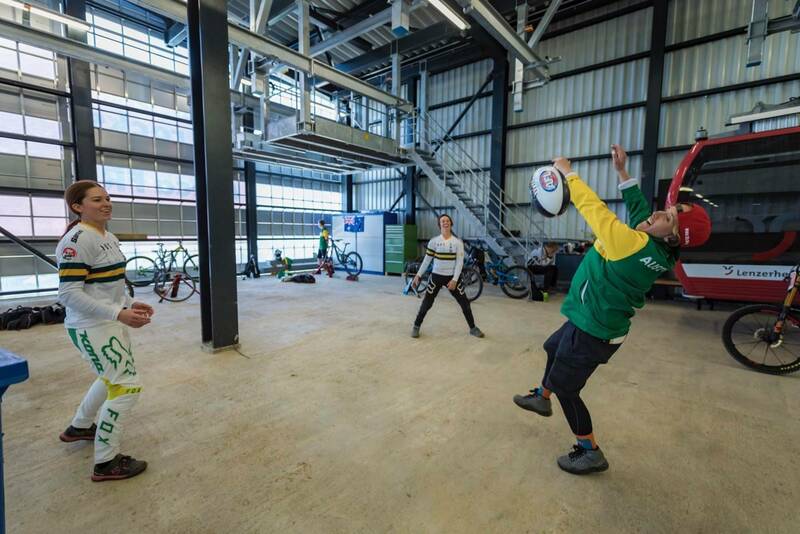 "After watching practice and being blown away by the speed, I knew it would be fast. It would be all or nothing. You could win or crash and either one would be ok. It worked out ok this time." Still, the week before, Atherton didn't come in feeling confident in winning. "I thought coming into this, there would be a slim chance I could win. I was pretty nervous, and we all know any one of us could win." And then, she won by 10 seconds. 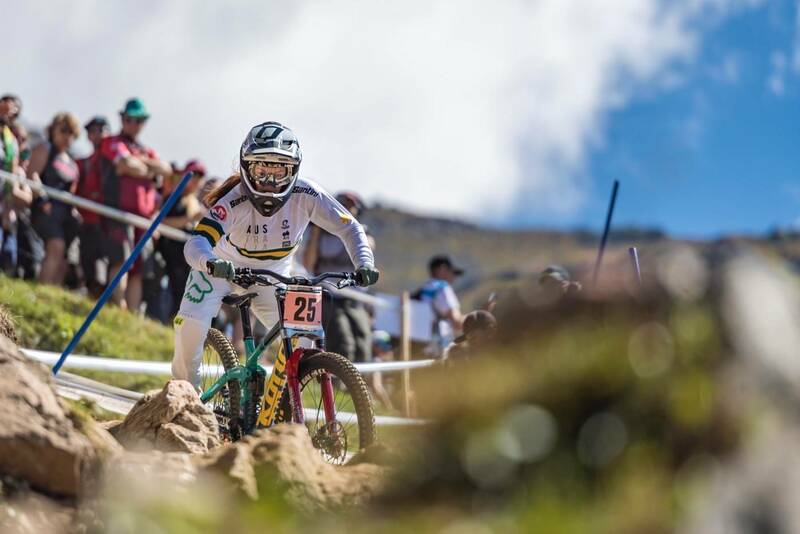 Tahnee Seagrave was one of the riders many thought would bring the fight to Atherton - especially given how close they have been in times this year. But Seagrave was happy to make it down in one piece, and get a medal at Worlds. "I was figthing my own fight today. I just wanted to make it down. I crashed in quali's and I just didn't want to risk it today. Just getting a medal was a hige achievement in itself." 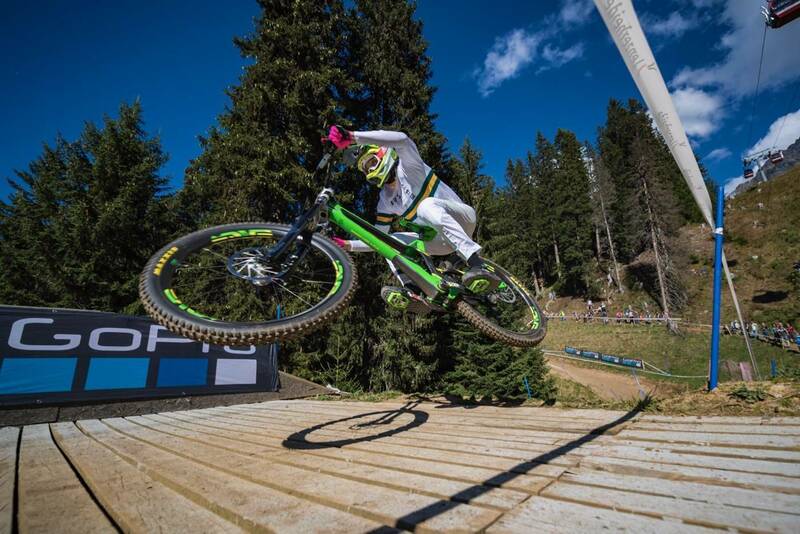 Myriam Nicole may not have had the greatest start to the season - but she did have a great World Champs. "I'm really happy. The last two races have been a bit of a struggle. I had a lot of fun all weekend." Especially with such an enthusiastic crowd on track, which Nicole said she loved, "It was great on the track, and at the finish." 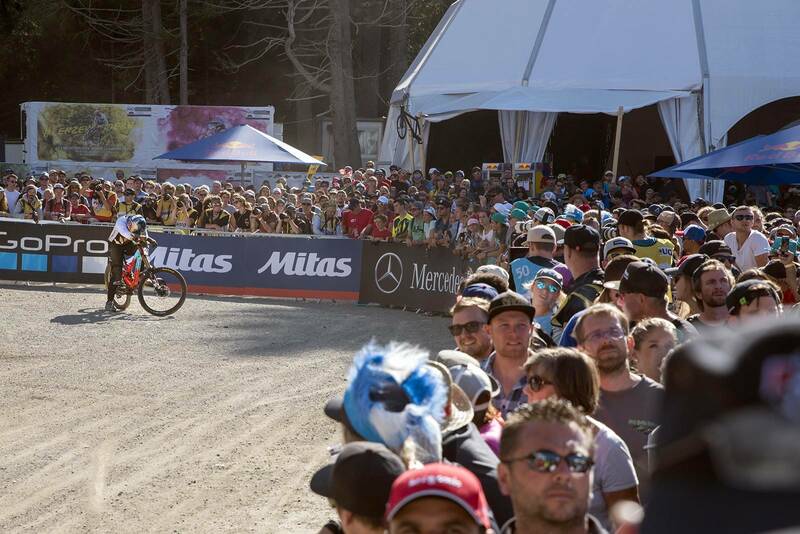 With the day warming up and the track getting dusty, the Elite men were due to start. 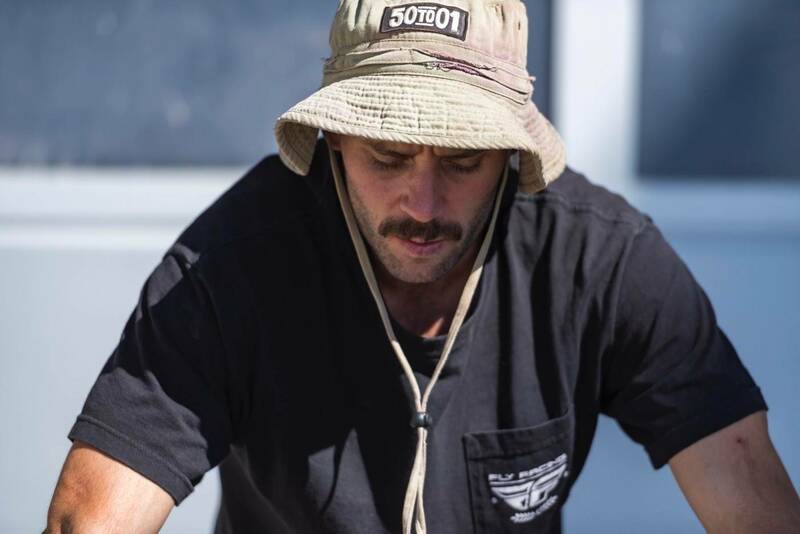 Jackson Frew posted a good time early but it was South Africa's Greg Minnar who landed himself in the hot seat for a long time. 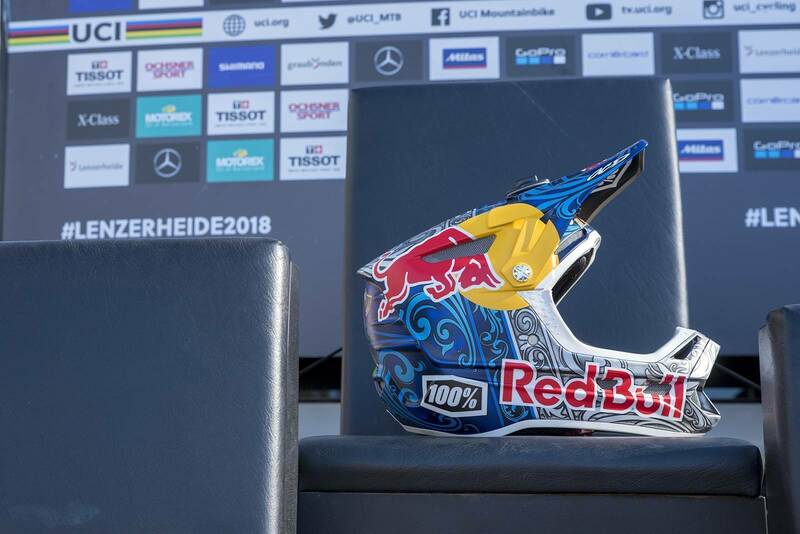 Other favourites came and went but it wasn't until Belgian rider Martin Maes, who was a surprise winner of the World Cup in La Bresse, came down that Minnar was off the top chair. And Maes stayed there a long time. 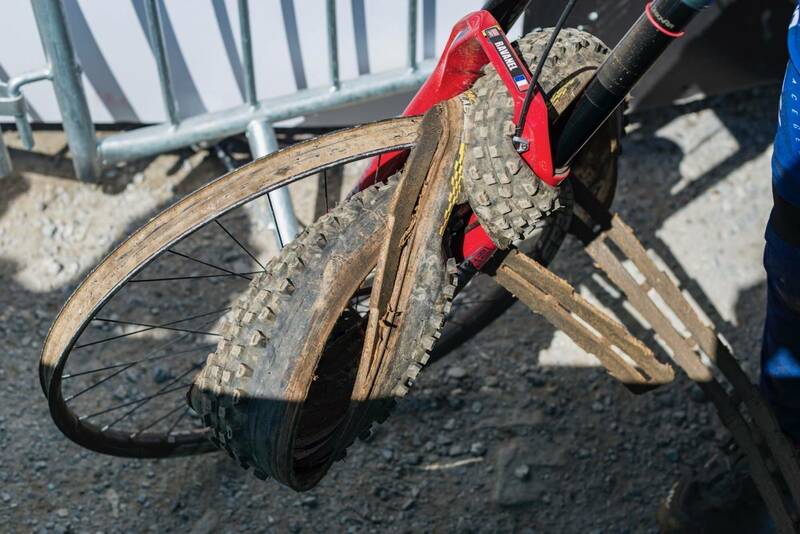 It wasn't until defending champion Loic Bruni hit the course that it looked like Maes' time might fall. 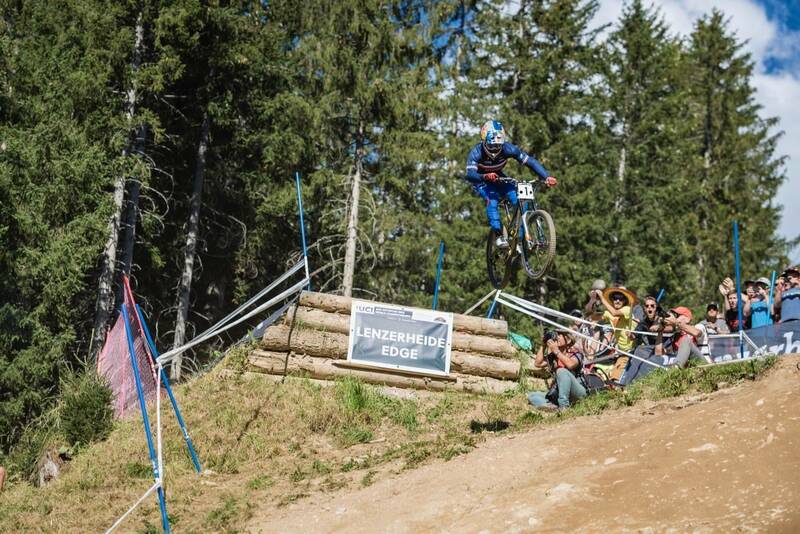 Bruni had the compsure and fluidity of a champion - looking so smooth he didn't even seem to be going fast. Nothing silly, just efficient speed. 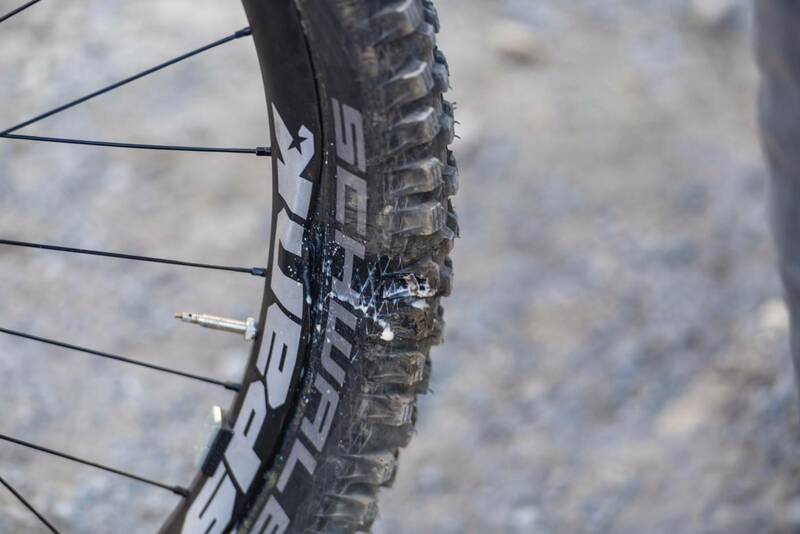 He made a point of displaying the sticker on his chainstay at the bottom, #strengthforjared, in reference to Specialized EWS Team mate Jared Graves, who is in medical care for a tumour. Bruni posted the fastest time and moved into the lead - but with Brosnan, Hart, Vergier and of course Pierron to go - nothing would be certain. Lots of the riders were up, or close, on splits, but the middle slower section was where Bruni was still fastest. 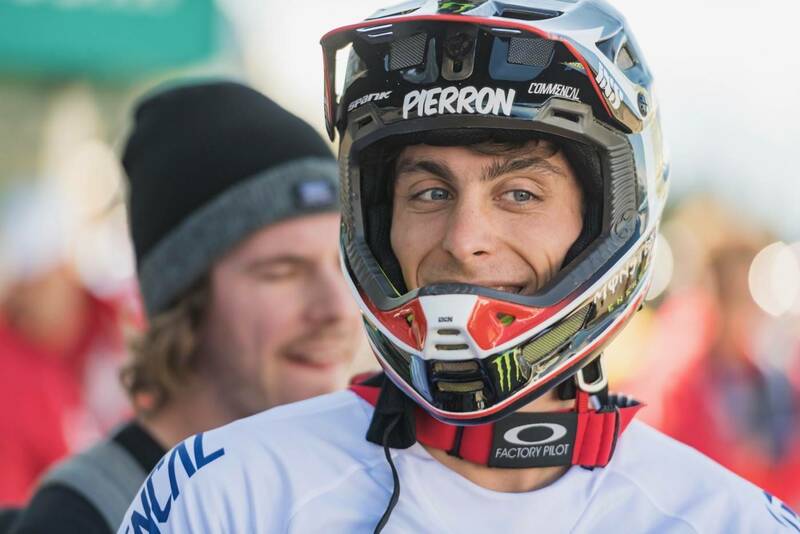 When the last rider to come down, Amaury Pierron, was about to start, nothing was certain. 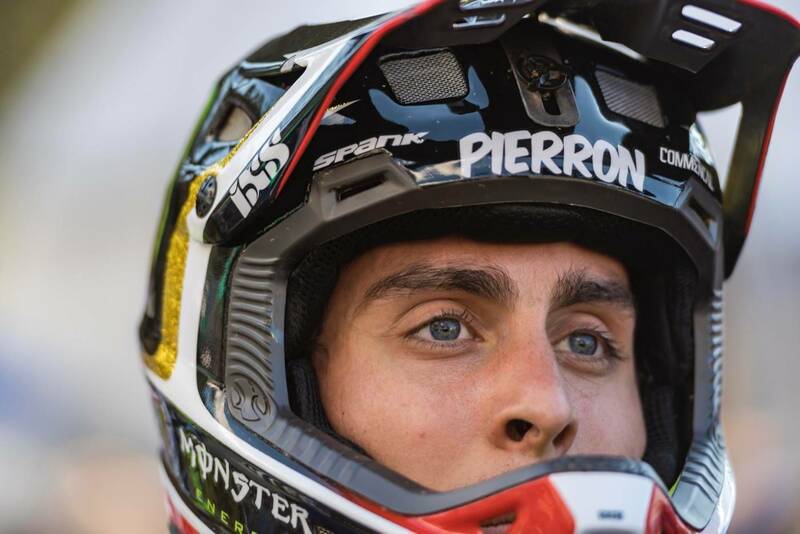 Pierron, Vergier and Bruni have been pushing each other all year, so could Pierron top Bruni? He was behind on the splits, until mid-way down he crashed, which had him knocked around for a while. He got back on and finished in the top 10 - but Bruni's victory was sealed. 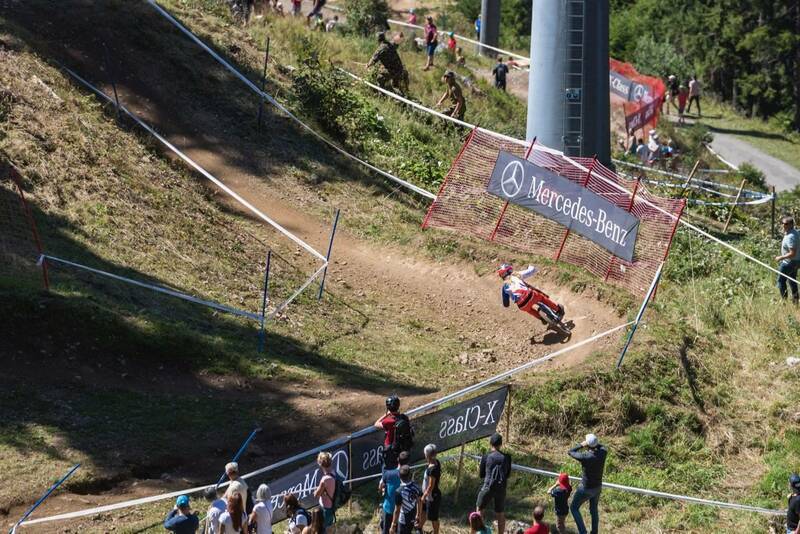 Loic Bruni didn't come in thinking he could nail it on the course. 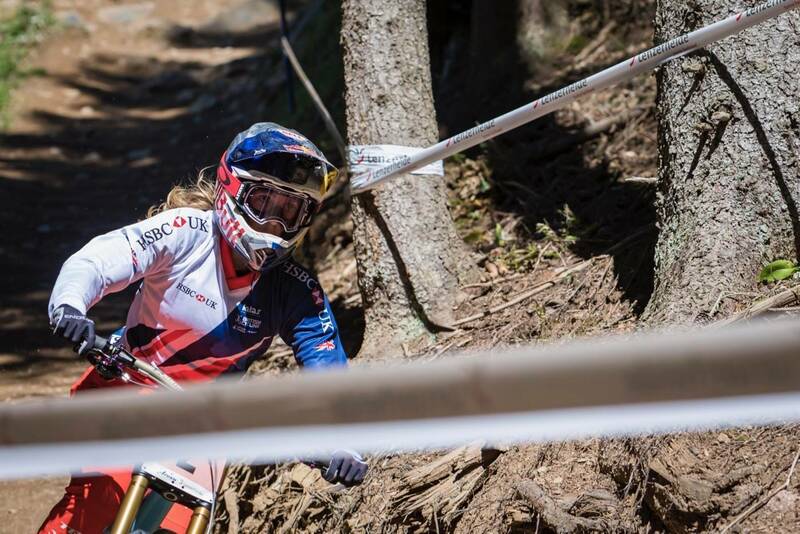 "The last two World Cups have been hard here in changing conditions for race runs. I didn't want to make the same mistakes as last year here. The track was not too bad, except in some dry sections. It was the best condition we could have hoped for. It wasn't snowing." And while many would state Bruni was here to defend his title - he stated he was here to win another, a totally different mind set. "When you're at the start gate you don't think you are defending the title, you are just going for it trying to grab another one. It was beautiful weather, nice and quiet - I didn't defend my title, I went out to grab this one. Loris, Martin and Danny - the times were all so close. It was a good race." 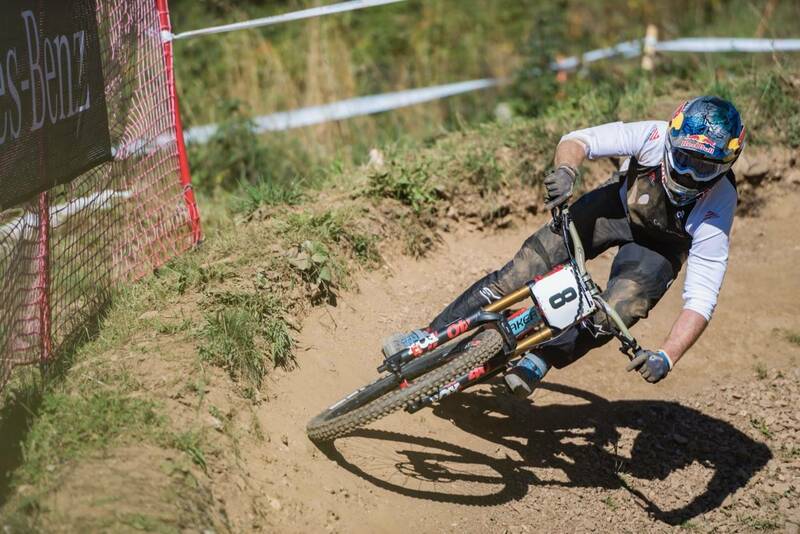 Martin Maes was quizzed in the press conference about getting at ease on a downhill bike - something he's clearly been doing. 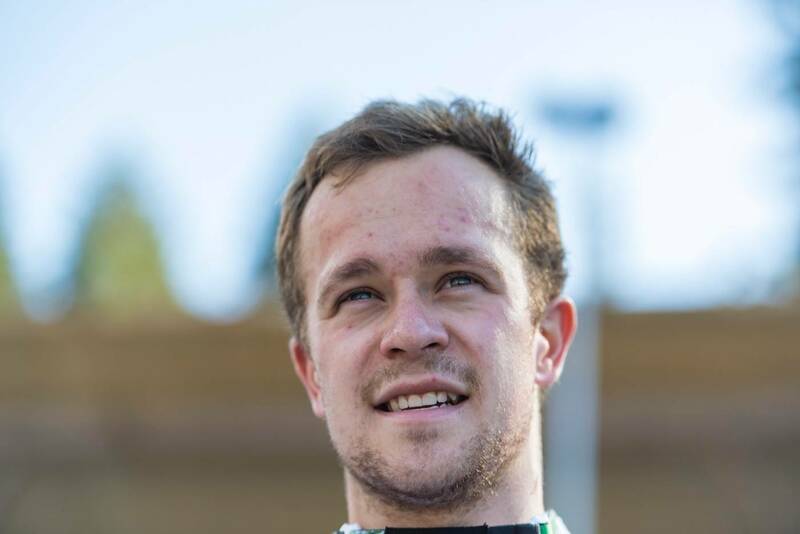 "I felt good on the track, I knew I could do something. Like Loic said, it was a hard track to be conistsnt on. The track has changed a lot over th week and it was pretty dry today.The goal was to prove I could ride fast on a dry track as well. Job done, I'm happy to be on the podium of a World Championships. 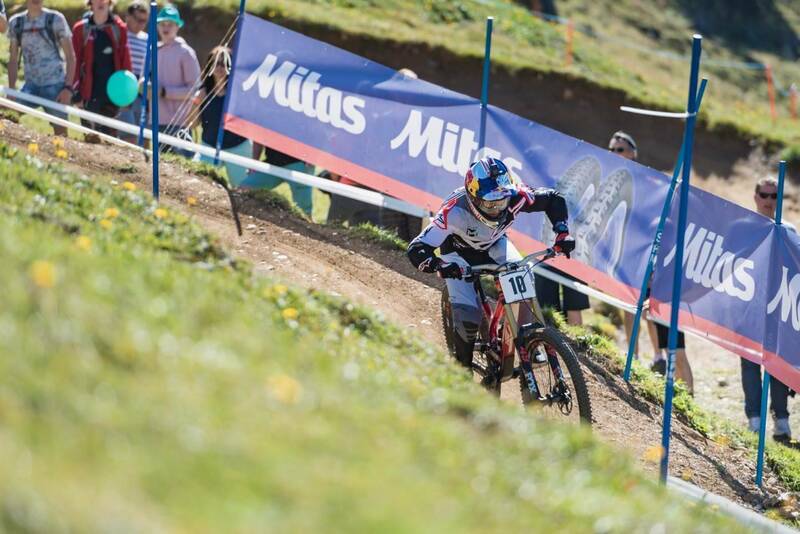 Racing Enduro is different, and it's good to show I can be fast in downhill too." 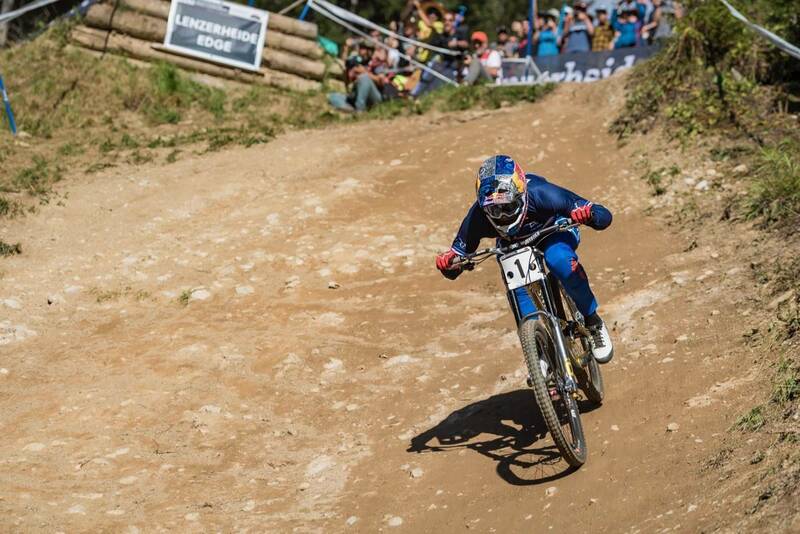 And on Enduro versus Downhill - would he be doing more next year? "After the season, maybe. 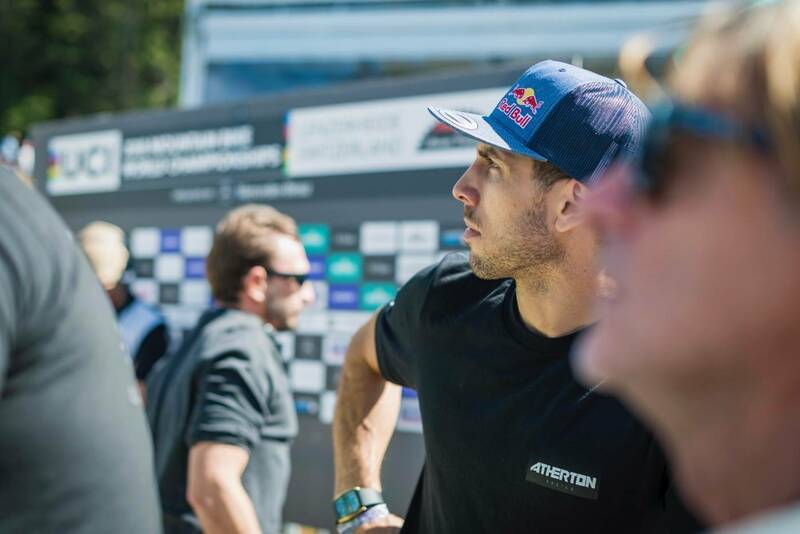 I have to be focused for the next two races. I'll make my decision over winter." "But which do you prefer?" 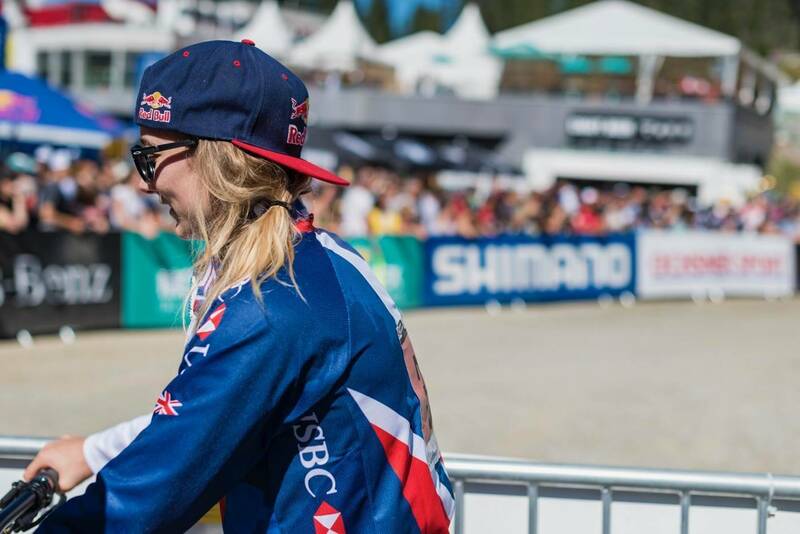 Asked Rachel Atherton. "There's not enough biking in downhill," stated Maes. "Four days but only a few minutes of riding. I feel like it's just not enough. 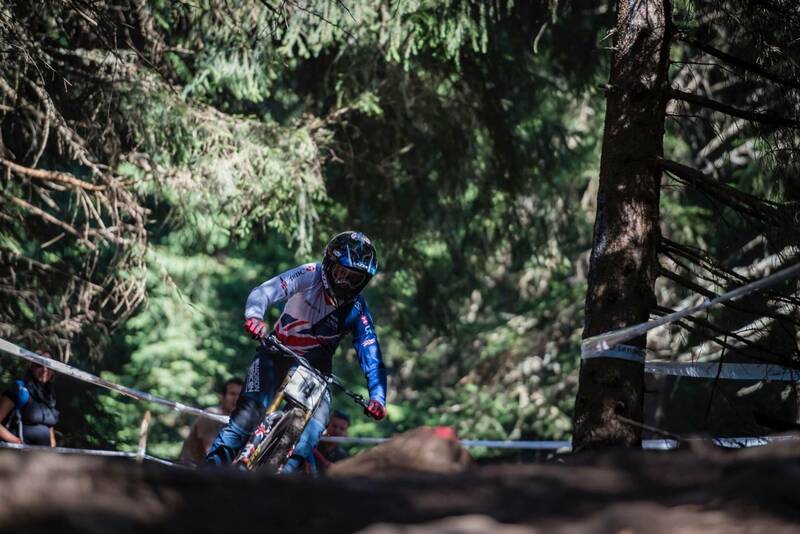 I learn more about riding in Enduro than downhill." 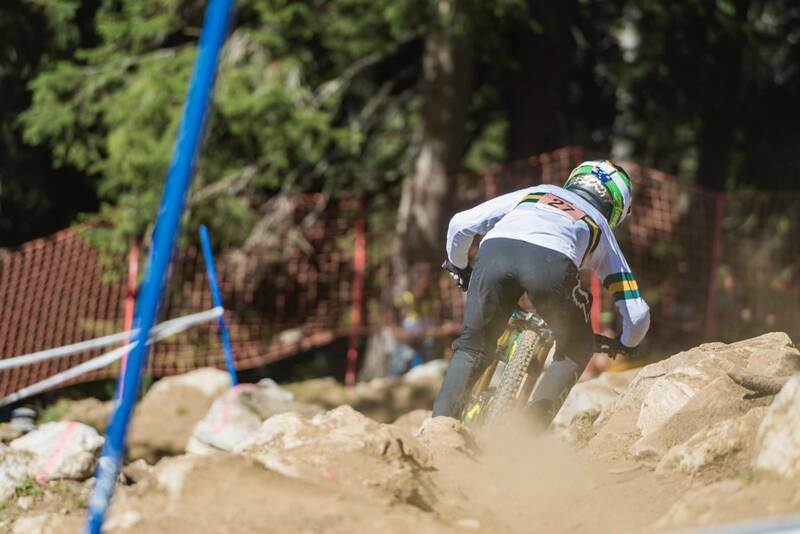 Danny Hart turned in a solid run for 3rd, but spoke of the conditions really having changed. "It's all a bit of a blur. I looked out of the start gate and I could see it was much drier. The perception of where to put your wheels and so on was all so different. That go the heart rate up right away. I got a good run and didn't have too mnay moments like I have in the past." 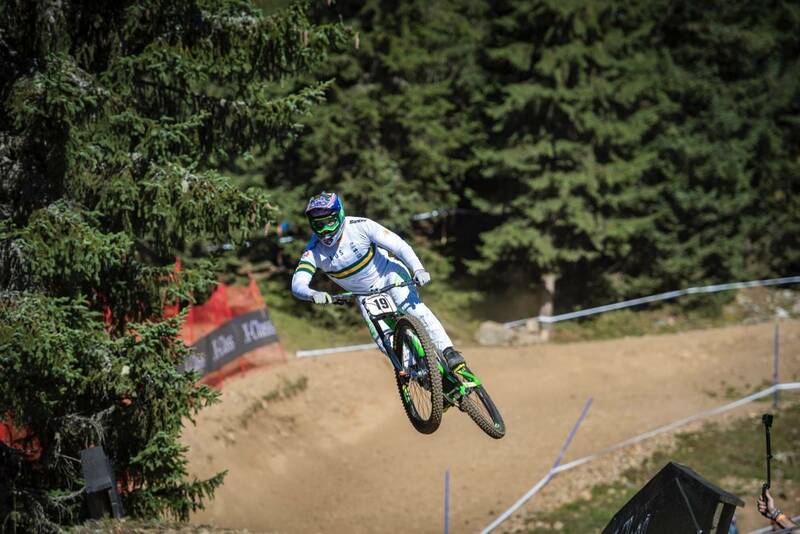 "It's my first year with a new team and I'm happy with how the season progressed, with a 3rd at World Champs." Added Hart. "When it rained two days ago, everyone knew come Sunday it would be quite good. So we were all ready for good conditions. What struck me was how different the track looked in front of you, even after practice this morning." Atherton chimed in again, "did you decide to use a different tinted lens because it was drier?" That's it - the World Championships are over. 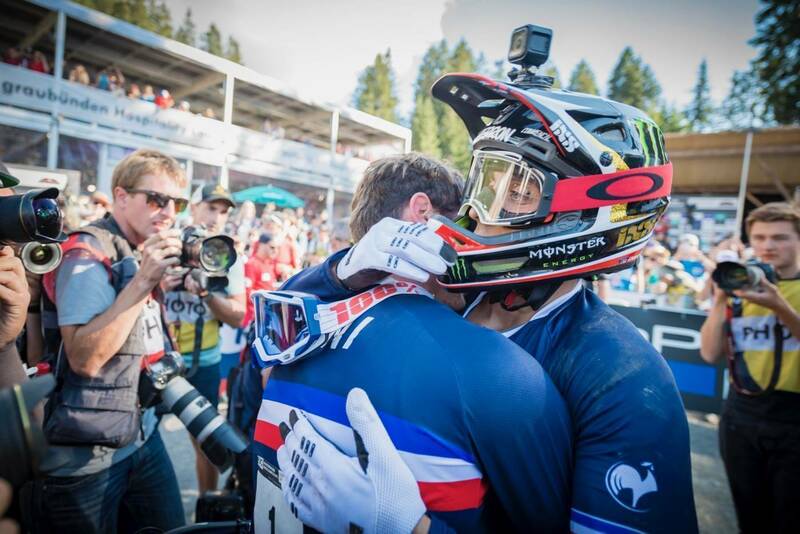 Lenzerheide and Switzerland really delivered for this World Champs. 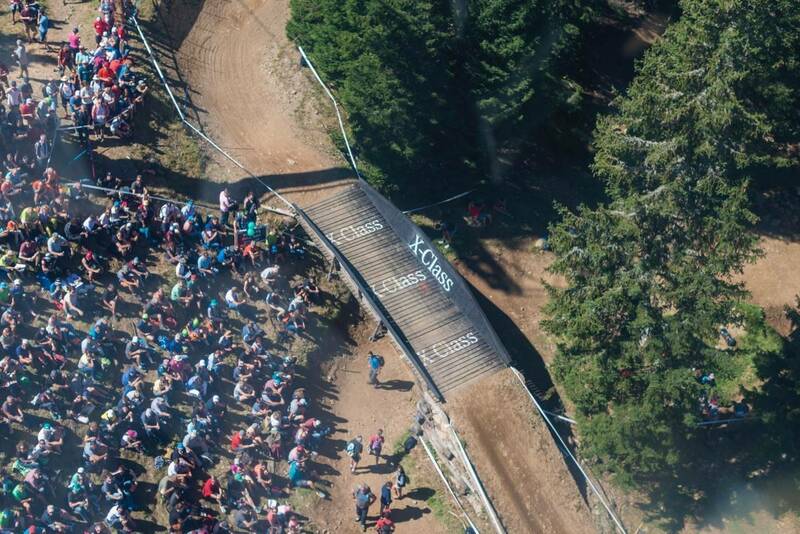 The vibe was immense, the racing was tight, the crowds were phenomenal! Best of all there was plenty of cracking riding to be done outside of the race track if you had your bike with you. We'll have some more coverage to come - stay tuned.